With every passing year, SEO moves further away from the realm of clear and simple guidelines to the world of blurry indicators and stringent punishments for perceived transgressions. Once upon a time, SEO was synonymous with zeroing in on the right keywords and going crazy with a million iterations and use cases for these keywords all over your site. If you stuffed your site, its meta data, and HTML tags with enough keywords, it was enough to win the battle against Google. It was simple to do and easy to understand, albeit not the most ethical of practices. Today, that A = B correlation between keywords and search rankings has been diluted to an unrecognizable degree . A whole host of other factors have sprung up to dethrone keywords from their venerable position at the helm of SEO for years. These include social signals, user reviews, editorial links, local SEO-like citations, and a ton more. 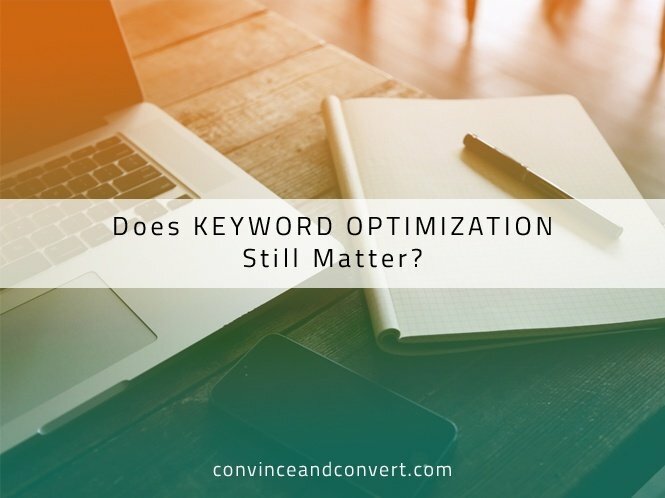 Nevertheless, this gradual shift away from keywords does not mean keyword optimization is dead and gone. It just means it has morphed into a new avatar, to be utilized in the right manner given the right circumstances. A decade ago, the most common place for keywords to make their presence felt was in the body copy or content of a webpage. The levels of keyword stuffing that went on in the name of better search rankings gave SEO such a bad rap that it took years to shake it off. My bet is that it probably contributed to the Panda update, which attacked sites that created reams and reams of worthless content with their top keywords in it (or “thin content,” as Google calls it). No SEO professional in their right mind would consider keyword stuffing anymore. However, that does not mean keywords are irrelevant. Using them in the right place and in the right amounts can still get you prime spots on search engine results pages and drive huge traffic to your site. Page title: Keep your page title under to under 55 characters, and make sure you include your most important keyword in it. Don’t resort to stuffing your title with twenty iterations of your keyword—you’ll only end up looking spammy and be penalized for it. Header tags: H1 and H2 tags tell search engines that the header is important. Including a keyword in these tags ensures that your keywords get picked up and help your ranking. Avoid using images in your header tags to avoid confusing search engines. Meta description: A meta description is that snippet of information that appears under a search result on a SERP and tells the user what the page is all about. In short, the meta description is your make-or-break factor to get a click-through, once your page gets a decent ranking on a SERP. A good meta description is no more than 155 characters long and contains the keyword for which you’re trying to rank. Alt tags: Images that you upload to your pages can also help you in getting a good rank, as well as CTRs, thanks to Google’s modified layout that gives precedence to image results, even for general searches. Since Google is essentially “image blind,” you need to make sure you include your keyword in every descriptor of your image. That includes alt tags, image file name, description, and the caption. Content: This goes without saying. Your content for each page needs to revolve around your keyword—just one keyword, not as many as possible. It’s OK to use synonyms, phrases, and figures of speech that stand in for your keyword, as long as they mimic natural speech patterns. Content headline: Your content title must contain your keyword to ensure a decent rank. Not only does it tell search engines that you have some very focused and relevant content about your keyword on your page, it also improves click-throughs by informing the user of the same. And yes, there’s more to the headline than keywords. URL: Including your keyword in your page URL should not be confused with creating exact match domains, which is a black hat practice frowned upon severely by most search engines. Use your keyword in the URL at least once and in such a way that it describes the page contents and helps the user in navigation as well. As discussed earlier, keyword stuffing (or even keyword embellishments across your pages) is a practice that is as out as Elton John. 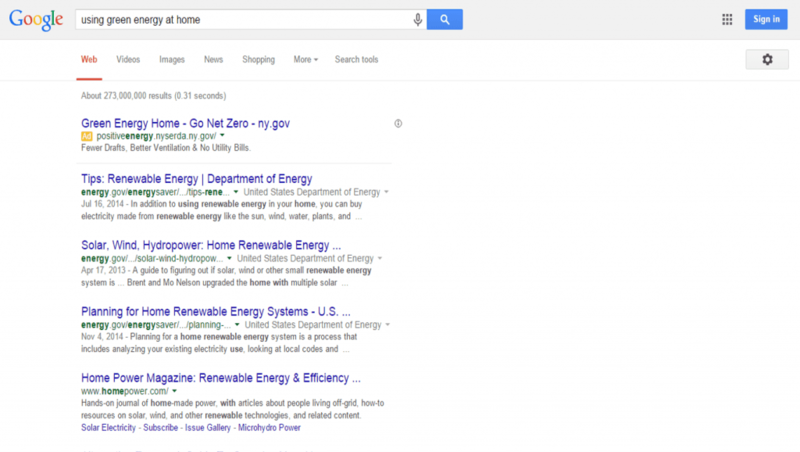 Google’s Hummingbird update put a firm end to the supremacy of keyword density over all else. With its shift to semantic search, Google changed the way we search (and optimize we search) forever. Google now emphasizes understanding natural language patterns and divining the meaning of a query from the context of the entire sentence, instead of looking at individual words. The focus is on understanding user intent and offering results that would be most relevant to them. For example, a query like “Using Green Energy at Home” offers me results about what renewable energy options are available for home use, how I can implement renewable energy inside my home, and so on. Without semantic search, I’d probably have gotten results relating to individual words in the query. With intense keyword optimization for each word, I’d probably have ended up with results about the color green or home improvement, or maybe even foods that provide energy. So how would you do it? Today, keyword optimization means tracking down every possible keyword that could be relevant to your target audience and optimizing for each one of them. A feature like “Low Hanging Fruits,” offered by RankWatch, gives webmasters inspiration for keywords they may not have considered yet but are critical in a semantic search context. 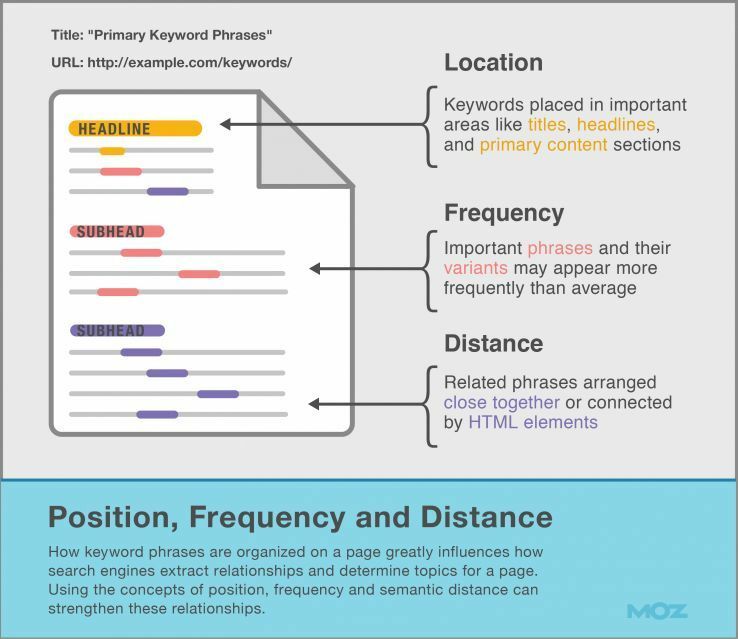 Build content around these keyword sets that answers users’ questions. Let your keywords appear in varying contexts within your content. If you sell soap, don’t just create content around soap, the types of soap, or the how soap works. Create content like “How Soap Affects Skin Quality” or “Learn how to make soap at home,” or even “Where can I buy discount soap in Chicago?,” and so on. Work with variations or synonyms of your keyword, and create content around them. Using Latent Semantic Indexing, search engines can match content with unstructured user queries that may not even contain your keyword but are related to it from a contextual perspective (e.g. “green energy” and “renewable energy” in the example above). Let your content be aimed at pleasing human readers instead of search spiders. A well-written, informative article will get read and shared extensively by your target audience by virtue of its quality. This popularity will in turn help your content surface more often in search results, creating a virtuous cycle. Local SEO is all about injecting a local context to your traditional SEO efforts. Listing a local business on leading directories, earning citations from authoritative sites, and optimizing on-page factors with inputs like the name and contact information of the business are all key aspects of what makes local SEO tick. Keywords, especially keywords from a local perspective, are integral to making local results stand out. So instead of optimizing for “law firms,” “lawyers,” or “cheap legal advice,” a local business could optimize their content with local keywords like “law firms in the lower east side” or “cheap law firms near me,” and so on. A citation is essentially a listing of your business with its name, address, and phone number provided for the user. For citations to help towards your local SEO, your citations across all directories, review sites, and other third party websites need to be consistent, if not identical. A citation also typically carries a description of your business—the perfect place for you to seed keywords that matter to your site. Even though SEO now awards winning search rankings on the basis of fabulous content, there are still incredibly useful ways keywords can be relevant. By marrying the fundamentals of content marketing to the science of keyword research, you will be doing your site a huge SEO favor. And who among us doesn’t like favors?